Product categories of Corded Sticker Vacuum Cleaner, we are specialized manufacturers from China, Lightweight Upright Vacuum Cleaners, Corded Sticker Vacuum Cleaner suppliers/factory, wholesale high-quality products of Corded Handheld Vacuum Cleaner R & D and manufacturing, we have the perfect after-sales service and technical support. Look forward to your cooperation! This style is a Corded Sticker Vacuum Cleaner. It also is a 4 In 1 Vacuum Cleaner. What is 4 in 1,that is vacuum,blow,handle and stick. This function let you can use it in many places. This Vacuum Cleaner is very a lightweight vacuum cleaner,so when you use it,you will be comfortable. The function of blow that you can blow anything. 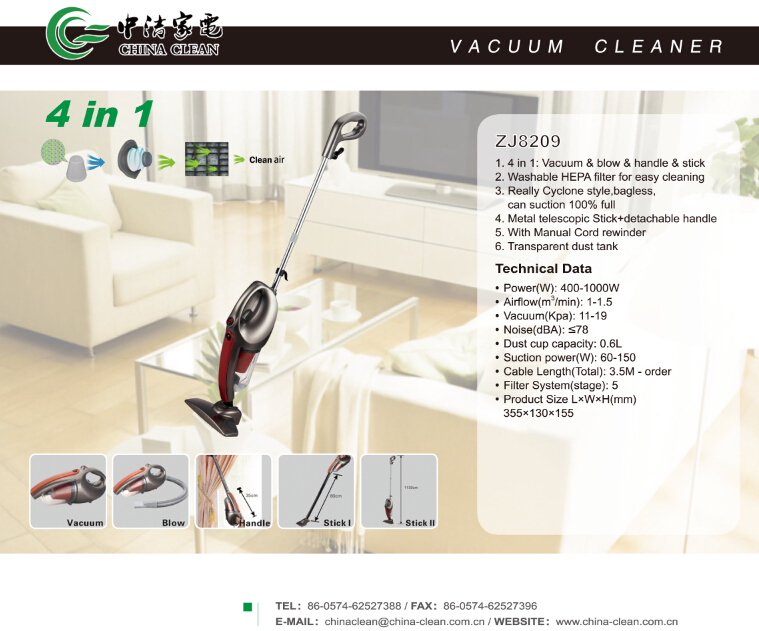 It's a useful vacuum cleaner with 4 functions,hope you will like it. Now let's see the pictures about it.